Wild populations are renewable resources, and several indicators have been created to identify sustainable extraction levels. 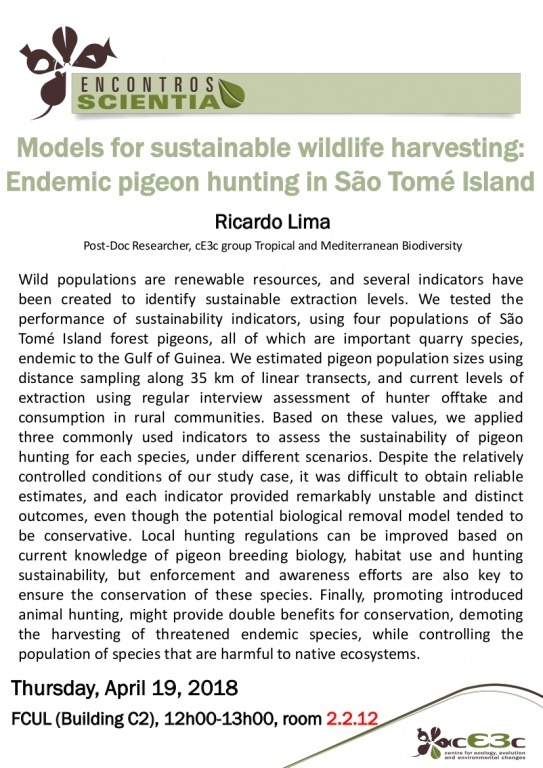 We tested the performance of sustainability indicators, using four populations of São Tomé Island forest pigeons, all of which are important quarry species, endemic to the Gulf of Guinea. We estimated pigeon population sizes using distance sampling along 35 km of linear transects, and current levels of extraction using regular interview assessment of hunter offtake and consumption in rural communities. Based on these values, we applied three commonly used indicators to assess the sustainability of pigeon hunting for each species, under different scenarios. Despite the relatively controlled conditions of our study case, it was difficult to obtain reliable estimates, and each indicator provided remarkably unstable and distinct outcomes, even though the potential biological removal model tended to be conservative. Local hunting regulations can be improved based on current knowledge of pigeon breeding biology, habitat use and hunting sustainability, but enforcement and awareness efforts are also key to ensure the conservation of these species. Finally, promoting introduced animal hunting, might provide double benefits for conservation, demoting the harvesting of threatened endemic species, while controlling the population of species that are harmful to native ecosystems.